John William Godward RBA (1861-1922) was born into a wealthy family which thoroughly disapproved of his becoming an artist. Nevertheless, he became a painter, based in London, and exhibited at the Royal Academy from 1887. Godward's subjects are typically beautiful girls in classical robes on marble terraces. 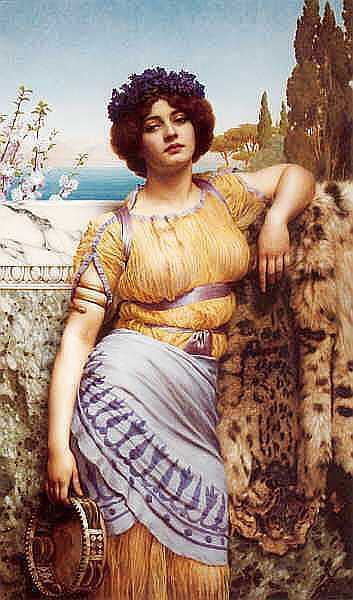 He was the most skilled from a number of artists who followed the highly popular style of Alma Tadema. Typically, his paintings are without any story, focussed on a single girl, large on the canvas, semi-draped or wearing translucent garments, giving a sensuality somewhat diminished by the careful, classical composition of the rest of the picture.